Located in the lower half of New Zealand’s North Island, Manuwatu is situated on the southwestern side of the island and is known as a picturesque adventure playground. The main city of Manawatu, Palmerston North, is located 2 hours north of Wellington and is home to breathtaking dramatic scenery and ancient native bushland. Manawatu accommodation is mostly concentrated in Palmerston North and offers contemporary country retreats, modern hotels, traditional kiwi farmstays, comfortable motels, family-friendly resorts, charming bed and breakfasts and more. Concentrated in the city centre, a variety of Palmerston North accommodation can also be found in nearby Feilding and the wider Manawatu region. 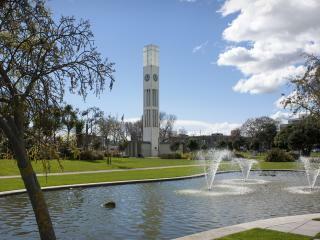 Close to a number of local shopping and dining options, Palmerston North accommodation also enjoys easy access to a variety of the region’s most popular activities and attractions. Ranging from 3 stars to 5 stars, Palmerston North accommodation offers something for all travellers and budgets. Accommodation ranges from luxury retreats to country hotels, traditional farmstays, contemporary motels and relaxed bed and breakfasts.